Mick Flannery is an Irish singer-songwriter from Blarney, County Cork. 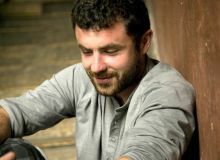 His debut album Evening Train resulted from his time spent studying music and management at Coláiste Stiofáin Naofa in Cork. It featured tracks which had previously won Flannery two categories at the International Songwriting Competition in Nashville, Tennessee, as judged by his idol, Tom Waits. He was the first Irish musician to win in this event. Flannery's second studio album White Lies was released on September 12, 2008, achieving a top ten position on the Irish Albums Chart. It later went platinum and was nominated for the Choice Music Prize. Flannery won Best Irish Male at the 2009 Meteor Awards. Influences include Kurt Cobain, Leonard Cohen and Bob Dylan. A native of Cork, Mick was awarded two first place prizes in the renowned International Songwriting Competition. Mick took the grand prize in both the "folk-singer/songwriter" and "lyrics only" categories. Judges for the competition included Tom Waits, Loretta Lynn and a host of record company executives. Mick recently won the Meteor Award for best male.